No contract, no commitment! Choose only the services you need! No POS required, all you need is an internet connection and our online ordering solution. Easily update your menu content and pricing with our admin tools. Accept credit cards online with our partner merchant providers. 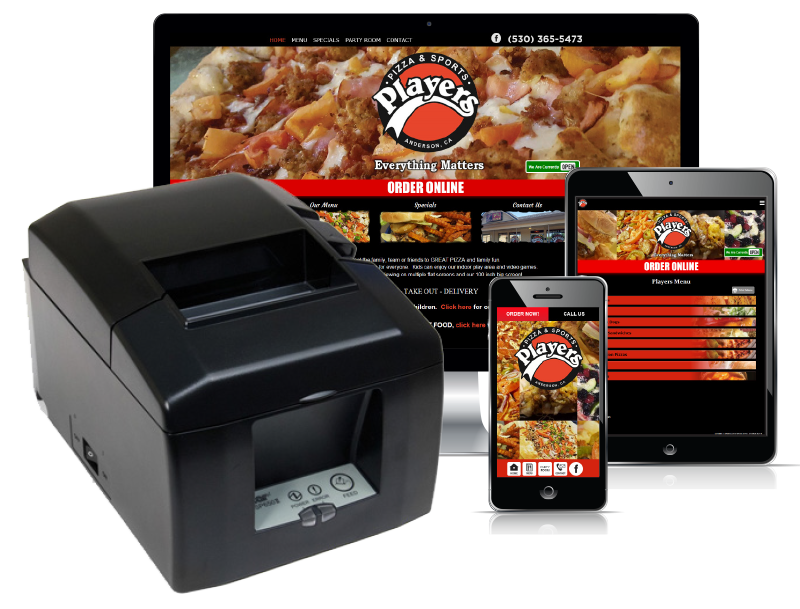 It works great for delivery, pick-up or catering orders. Your online orders will flow seamlessly and deposit funds into your business bank account. We built our website solution specifically for restaurants, we know what you need to have a successful online presence. We will customize your website to your restaurant's look and feel .. it will look and function great on smart phones, tablets, laptops and desktop computers. Easily update your online menu, coupons, specials, events, and more with our state-of-the-art admin tools. With our restaurant solution you can post your menu, specials, events, or any other content to your in-store digital menu boards. Imagine updating your online menu, online ordering and in-store digital menu boards in one place... that is what you can do with Top Restaurant Solution's digital solution. Our restaurant solution also comes with a built-in email marketing tool. Add a sign up form to your website and collect visitors information. Whether you want to have exclusive offer club, birthday club, or any other type of sign up form, you can easily add this to your website and start marketing to your customers directly... and at no added cost. Our online ordering system is completely cloud-based, meaning there is no software you have to buy, install or update. All you need is our online ordering solution and an internet connection. You can receive orders by way of email, text notification, laser printer or a thermal receipt printer (Star Micronics TSP650II). If you want to accept credit card payments online we can get you setup quickly with one of our merchant partners. That's it! We will walk you through the easy-to-understand setup process of getting your menu entered, and get you receiving online orders quickly. We don't take any percentage of your sales! You only pay us a low monthly fee for the ordering solution. There are no contracts and no commitments, use our ordering solution for as long as you'd like. To accept credit cards online you will need to have a merchant account. The merchants we work with are WorldPay and PayPal. Already have a PayPal account? Great, then you are already set to go. If not, we can have a representative from one of our merchant partners contact you about getting your account setup. Remember, our online ordering solution works independent of in-store P.O.S. systems, so if you currently have a P.O.S. system there is no need to change anything. Our solution is for online orders only and can work side-by-side with your existing P.O.S. Get started today and your customers will be able to order food from your restaurant from their smart phone, tablet, laptop or desktop computer. Their orders will print automatically (if using a receipt printer or laser printer option) and their payment will be deposited to your bank account. Clean and easy.